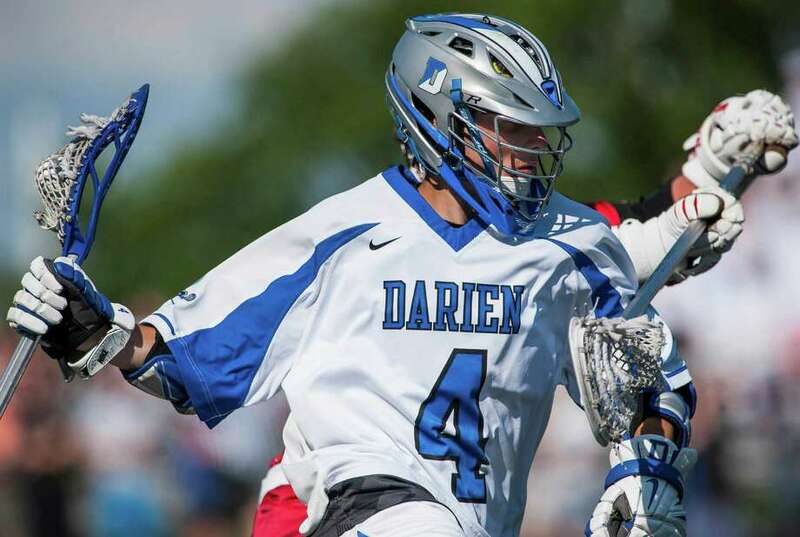 After finishing an uncharacteristic 12-8 in 2013, the Darien High School boys lacrosse team wanted to prove a point last season. Determined to prove they were Still the best team in the FCIAC, the Blue Wave went out and produced a 23-0 season -- a campaign that included the FCIAC and Class M championship. "Any time our program had a year like the year before it serves as motivation," Darien coach Jeff Brameier said. "I felt we evolved last year and really had a dream season. The team really came together, it was really a solid group of kids." Dominant in the Class M Tournament for years, the Blue Wave have moved up to Class L. That will indeed, make an already traditionally deep and competitive Class L Tournament even more interesting with the Blue Wave in the mix along with defending state champion Greenwich, state semifinalist Ridgefield and SCC powerhouse Fairfield Prep. As for the FCIAC, it's as strong as ever with New Canaan returning plenty of talent and Staples on the rise. Here's a look at the FCIAC. DARIEN: With premier attackmen such as juniors Jack Kniffin and Colin Minicus returning, a standout faceoff specialist in senior Andrew Pugliese back and junior Mark Evanchick -- who Brameier says "is one of the best lockdown defenders in the state," -- the Blue Wave have the components in place to produce another memorable season. The presence of senior captains Ian Burgoyne (midfielder) and Daniel Traver (longstick midfielder) also gives the Blue Wave a lot of quality depth. "We are a very fast, athletic and deep team," Brameier said. "We're going to run four on attack and five or six longpoles and go after it." Danbury: Nick Rhode, Sr., G; Corey Cherney, Sr. D; Eric Henry, Sr., MF; Justin Warren, Jr., A; Connor Warren, Jr., MF; Jordan Osuch, Jr., MF; Tommy O'Rourke, Jr. MF; Robbie Swenson, Sr. MF; Colton Cherney, Sr. MF; Nick Maloney, Jr., D; Tyler Disarro, Jr., A; Evan Bennett, Jr. MF; Andrew Diehl, Jr. MF; Brian Conlon, Jr. D; Aaron Moniz, Jr. D.
Darien: Jack Kniffen, Jr. A; Colin Minicus, Jr., A; Ian Burgoyne, Sr., MF; Daniel Traver, Sr. LSM; Andrew Pugliese, Sr., MF; Mark Evanchick, Jr. D.
Fairfield Warde: Brendan King, Sr., MF; Danny Reale, Sr. D; Ryan Brown, Sr., MF; Gareth Gacetta, So., A; Jake Dougherty, Sr., D; Jake Fuss, Jr., D; Matt Coppola, Sr., G.
Fairfield Ludlowe: Alec Georgiadis, Sr. D; Warren Tobey, Sr. MF; Matt Doyle, Sr., MF; Trevor Demilt, Sr., A; Reilly Larson, Jr., A; Justin Horine, Sr., MF; Mitch Wykoff, Jr., D; Joe Casucci, So., D.
Staples: Isaac Paparo, Sr., D/LSM; Lucas Jackson, Sr. D; Mike Reale, Jr., A; Ross Goldberg, Jr. A; Connor Chamberlain, Jr. A; Tucker Bobrow, Sr. A/MF; Tanner Wood, So., MF; Ethan Berger, So., MF; Matt Johnson, Jr., MF; Peter Burger, Jr., G; Ben Schwaeber, Jr. MF. St. Joseph: Pete Bashar, Sr., MF; Preston Ouellette, Sr. A, Colin Powell, Sr. A, Mike Sudora, Jr. A Ryan Scinto, Sr. D; Kyle Souza, sr. D, Mike Braddick, Sr. G.
Trinity Catholic: Drew Scanlan, Sr.; Liam Shanahan, So. ; Justin Greene, So. ; Joey Nelson, Sr.; Nico D'Elia, Sr., G; Vincent Bellacicco, Fr. Westhill: Tom Thibault, G; Brendan Ronan, Sr. D; John Costello, Sr. D; Jake Scarvey, Sr. D; Joe Schlessinger, Sr. MF; Osbyn Sandoval, Sr. A; Zach Estrella, Sr. MF; Sam Jelliffe, Sr. MF; Connor Mathemy, Sr. MF; Matt Winters, Sr. MF. Wilton: Reid Melillo, Sr. MF; Tyler Mirabile, Sr., D; Jack Dexter, Sr., D; Christian Hansson, Sr., Jameson Hill, Sr. G; Harrison Bardwell, Jr., MF; Peter Koch, So., MF; Luke Rizzo, Sr., MF; John Maudsley, Jr., MF; Michael Lynch, Sr., A; Charles McGovern, Sr. A; Brian Calabrese, Fr. A; A.J. Hoffman, So. A. NEW CANAAN: The Rams, who lost to Darien in the FCIAC semifinals and state finals a year ago, return two of their three leading scorers from 2014 in senior attackmen Michael Kraus and Frank Cognetta. Junior David Strupp, junior Kyle Smith and senior Logan Hart provide strength on defense and at midfield. Buzzeo said sophomore goalie Drew Morris "is one of the best goalies in the state." GREENWICH: The Cardinals graduated some firepower offensively, but still bring back senior attack Decker Curran and add junior Michael Sands, a talented transfer from Choate Rosemary Hall, to the mix. Senior Griffin Tiedy gives the Cardinals an experienced defenseman, senior Tommy Rogan returns in goal and senior Michael Sullivan is at the faceoff X.
RIDGEFIELD: Perennial contenders in the FCIAC and state tournaments, the Tigers should once again, make their mark under the leadership of coach Roy Colsey. STAPLES: The Wreckers continue to ascend for coach Paul McNulty. Staples advanced all the way to the Class L finals, where it lost to Greenwich last season. WILTON: The Warriors are looking to rebound from a disappointing 2014 season. They didn't make the FCIAC or state tourney a year ago. "We hadn't struggled like that in a long time," Warriors senior captain Jack Dexter said. "We want to get back on track and instill that winning tradition once again." MICHAEL KRAUS, NEW CANAAN: The senior attackman, an All-FCIAC selection a year ago, will be relied upon to help spark the Rams' potent offense. DECKER CURRAN, GREENWICH: A senior, Curran (All-FCIAC, state selection last year), possesses a strong shot and has a knack for eluding defenders. SIMON MATHIAS, RIDGEFIELD: The senior attackman is a game-changer with his speed and elusiveness. He earned All-State and All-FCIAC honors last spring. IAN BURGOYNE, DARIEN: Coach Jeff Brameier said the senior midfielder "is a key guy in big games and always makes key plays." Burgoyne was named to the All-State, All-FCIAC team last season. JUSTIN MEICHNER, NEW CANAAN: New Canaan coach Chris Buzzeo said Meichner and Kraus are two of the more talented attackmen in the FCIAC. MARK EVANCHICK, DARIEN: With imposing size and strength, the junior All-State/All-FCIAC selection is regarded as one of the premier defenders in the state. He's big reason why the Blue Wave are tough to score on. ISAAC PAPARO, STAPLES: A senior, Paparo (All-FCIAC, All-State) leads the defensive-minded Wreckers as the team's top long stick midfielder. COLIN MINICUS, DARIEN: Look for the junior to emerge as one of the top playmakers in the conference for the high-scoring Blue Wave. DREW MORRIS, NEW CANAAN: Just a sophomore, Morris has the skills to develop into a standout in goal for the Rams -- one of the better defensive teams in the FCIAC. WILL PERRY, GREENWICH: Perry opened plenty of eyes with a strong sophomore season at midfield and should be primed to pick up where he left off from a year ago. FRANK COGNETTA, NEW CANAAN: Cognetta, an All-State, All-FCIAC selection last season, is a defensive mainstay for the Rams. JACK KNIFFIN, DARIEN: Kniffin, a junior, and Minicus give the Blue Wave quite a one-two combination at attack. MICHAEL SANDS, GREENWICH: Sands joins the Cardinals with impressive credentials after starring at attack for Choate Rosemary Hall. PAUL VOLANTE, RIDGEFIELD: The Tigers' main defender earned All-State, All-FCIAC honors last spring. JAMES CAMPBELL, BRIEN MCMAHON: The All-FCIAC standout anchors the Senators' midfield. DAVID STRUPP, NEW CANAAN: Look for the junior to turn in another impressive season on defense for the Rams. DARIEN AT NEW CANAAN (MAY 9): This is a rematch of the Class M tournament final, which saw the Blue Wave complete their undefeated season by posting a 10-8 victory over the Rams. Darien beat New Canaan three times last season, by a combined total of just four goals. With Darien moving to Class L this spring, the two teams won't meet in the state tourney, making their regular season matchup one for the fans to get even more excited about. RIDGEFIELD AT GREENWICH (APRIL 21): It wouldn't be a Greenwich-Ridgefield game without it behind a nail-biter. Greenwich needed four overtime periods to edge Ridgefield, 8-7, in last season's regular season meeting, then beat Ridgefield in OT, 7-6, in the FCIAC Tournament semifinals. In the Class L semifinals, the Cardinals took a third game from the Tigers, notching a 7-5 win. DARIEN AT GREENWICH (MAY 16): Two of Greenwich's three losses last season came against Darien, which topped the Cardinals for the FCIAC title. This game late in the regular season could be a preview of an all-important postseason matchup. GREENWICH AT NEW CANAAN (APRIL 25): The Cardinals posted an 11-8 win over the Rams last spring in a rematch of the 2013 FCIAC final won by New Canaan. This game could determine positioning for the FCIAC Tournament. WILTON AT RIDGEFIELD (APRIL 28): The Tigers rolled past the Warriors last season, so this will be a good test for Wilton, which is determined to put itself back among the the elite teams.